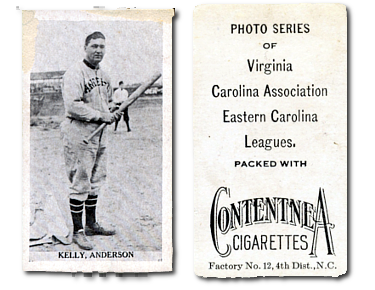 The 1910 T209-2 Contentnea baseball card set contains minor league players from the Carolina Association, Eastern Carolina League and the Virginia League. The T209 "Photo Cards" set contains 221 cards measuring 1 5/8" x 2 3/4". The 1910 T209 card backs identify the set along with ads for the Contentnea cigarettes brand. Very few of the subjects in this set actually made it to the major leagues. Key players featured in this set are the: T209 King Kelly, Ivy Wingo, and James Westlake. CLICK HERE if you want to sell your 1910 T209-2 Contentnea Black & White Baseball Cards. Showing 1 to 5 of 5 products.